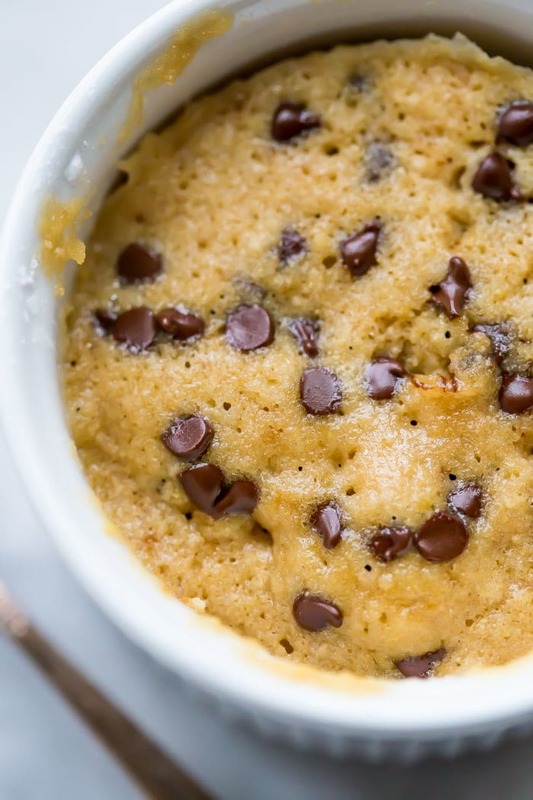 This paleo microwave cookie with chocolate chips is a perfect paleo microwave dessert! It takes only a few minutes and a couple dishes to make and produces a rich and tender cakey chocolate chip cookie that’s healthier for you. 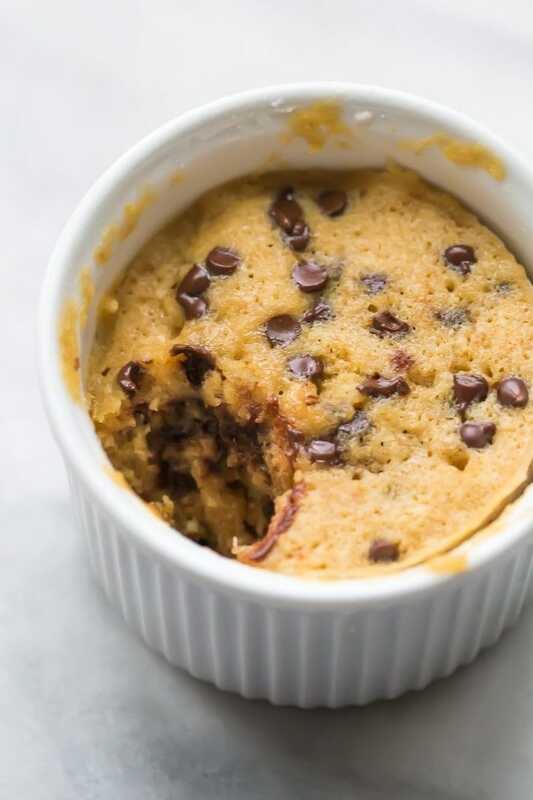 It’s certainly my favorite paleo microwave dessert so far, and I think this paleo microwave cookie with chocolate chips will become a regular in your repertoire! Been having a bad day? I know. Me too. That’s why we’re both here, right? You need a shot of comfort food, a bite of something sweet that pairs beautifully with box wine and Unbreakable Kimmy on autoplay, something that’ll make you feel good but not bad. Catch my drift? This paleo microwave cookie with chocolate chips is the answer to all your problems. Well, the thing is, I say all, and what I mean is… this paleo microwave cookie with chocolate chips is the answer to one your problems. The problem? Indulging in a feel-good sweet treat that takes like zero time and won’t make you feel bloated or give you a headache or make you sleep poorly. Long live the paleo microwave dessert! We rarely bake here. When we do, we tend to overindulge, eating four paleo brownies because they’re kind of healthy, and way too often substituting zucchini bread for an actual dinner (true story.). Or I test another recipe the next day, and we have two dozen cranberry muffins on hand, inevitably ending up being dumped, paper liners soggy from days of stagnation, in the trash. The shame alone of tossing treats is enough to make me need more. The solution, at least for us, is small batch bites. A recipe that I pare down to make only 4 cookies, a 2-muffin effort, a single microwave cookie. It satisfies what I want in the moment, takes only a few moments, and doesn’t take up $8 worth of almond flour. Yeah… I’m lookin’ at you, paleo baking. And that’s why this paleo microwave cookie with chocolate chips is totally the answer to all your problems. Or, well, at least the problem of quickly making a healthier treat that’s totally delicious and just enough. It uses minimal dishes (1 tablespoon of almost every ingredient all made in the bowl it’s nuked in!) and has no refined flour or sugar, making it a healthier treat that still tastes like it’s bad for you. 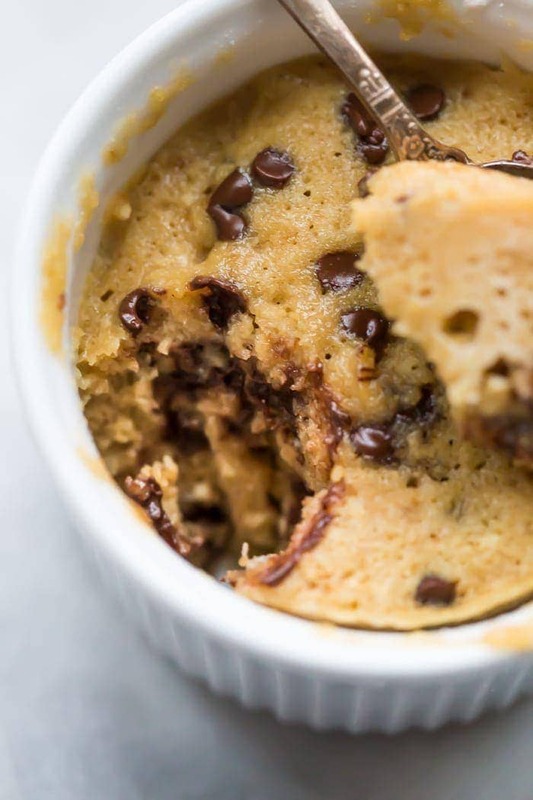 This paleo microwave cookie with chocolate chips is a perfect paleo microwave dessert! It takes only a few minutes and a couple dishes to make and produces a rich and tender cakey chocolate chip cookie that's healthier for you. 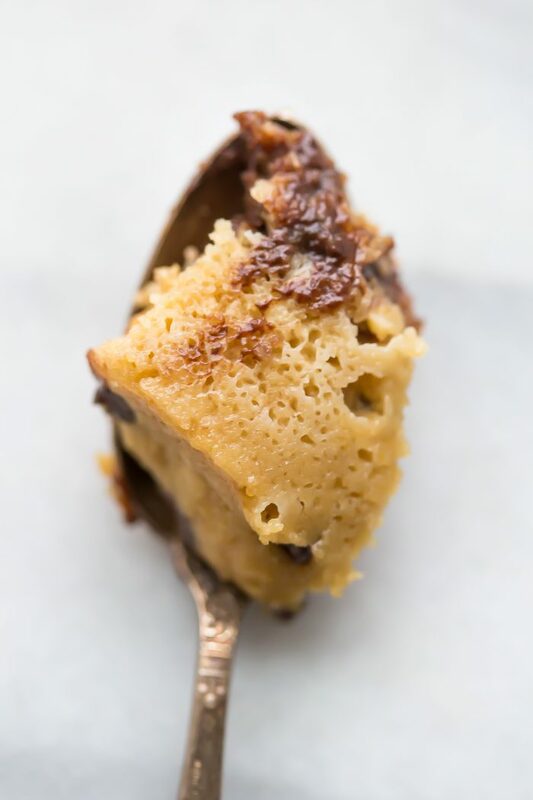 It's certainly my favorite paleo microwave dessert so far, and I think this paleo microwave cookie with chocolate chips will become a regular in your repertoire! 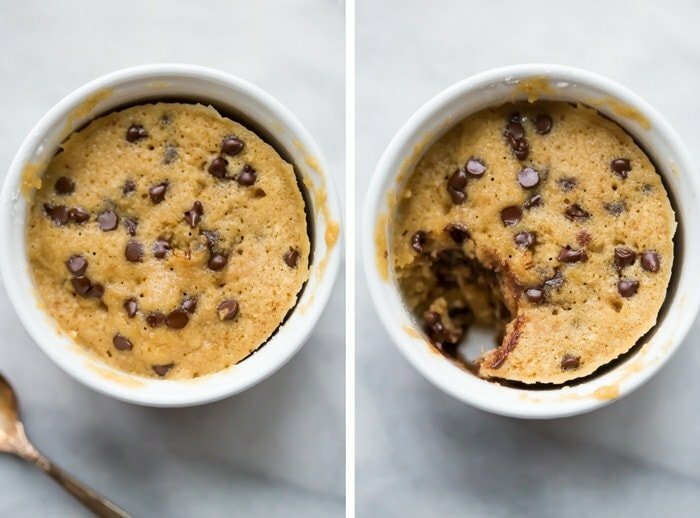 In an 8-ounce ramekin, stir together all ingredients except chocolate chips until well combined. Sprinkle in the chocolate chips and stir to combine. Cook in the microwave about 60-70 seconds. Start checking for doneness around 60 seconds: the cookie will continue to cook a bit and firm up after you finish nuking, so you want the texture to not be overly dry. Mine takes about 60-70 seconds usually. Let sit in the microwave 1 minute then remove and serve. I had a happy accident and took some homemade ghee too far and created browned butter ghee. It’s glorious. I decided to try it in this cookie recipe today and Oh. Em. Gee! SO good. Your recipes are all amazing! The BEST!!! And I have tried them all!! Thank you for a quick and easy treat! I’m so glad you like it as much as I do!! It’s definitely my fave, too 🙂 Thanks Melissa! This recipe is amazing! Finally a healthy version that isn’t dry! This will be my go to when I am craving something sweet. Thank you! Yay! I’m so glad you liked it. I recently created a caramel apple cake based off this recipe, and I think you’ll love it. I’m posting soon – I hope you try it!